Swell is a must-have show day preparation supplement that you won’t want to forget. 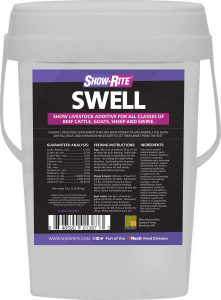 A highly digestible supplement, Swell has been proven to give animals the show-day fill, bulk and expansion necessary to set them apart from the rest. Pigs: Mix 4 oz. of Swell to 16 oz. (1 lb.) of water for each feeding. For best results, administer three feedings in preparation for the show: the first feeding the night before the show, the second feeding the morning of the show and the third feeding one hour before the show for best results. Shake well before each use. Sheep and goats: Mix 4 oz. of Swell to 1 gallon (8.34 lbs.) of water. Administer 1.5 lbs. of mixture every 4-6 hours. For best results, continue feeding application for 48-72 hours before the show. Shake well before each use. Beef cattle: Mix 8 oz. of Swell to 1 gallon (8.34 lbs.) of water. Administer 2 lbs. of mixture every 6-8 hours. For best results, continue feeding application for 48-72 hours before the show. Shake well before each use.